Tangau (seventh left) and Masiung (left of Tangau) in a group picture with new members of UPKO taken after the Triennial General Meeting yesterday. KINABATANGAN: Deputy Chief Minister Datuk Seri Panglima Wilfred Madius Tangau said he felt offended and insulted with the Education Ministry’s reply in parliament recently that the use of English as a medium of instruction in schools (in Sabah and Sarawak) would violate the Federal Constitution, National Language Act 1963/67 and the Education Act 1996. “It is disappointing and shocking. This is a lofty way of expressing an aspiration ‘to preserve and honour the supremacy of the constitution and the law’. Malaysians and Sabahans today, are a progressive society that do not need to be reminded of our Constitution. “I feel offended and insulted, really. We are tired of this justification that’s being presented to us. One that always belittles us, by reminding us of the supremacy of our Constitution, by accusing us of not respecting our Constitution; as if we do not understand what is right and what is not so right. “This justification of ‘honouring the supremacy of the Constitution and the law’ is always being presented to us so that those who question the manner our education system is being implemented can be accused of not respecting the Constitution, and to the extent of being subservient to foreign influences. I think this is not correct,” he stressed. Tangau, who is also UPKO acting president, said that using English as a medium of instruction is not illegal nor is it unconstitutional and is in no way an attempt to challenge the Malay Language, our national language. In fact, English can be used as a medium of instruction in national schools in Sabah and Sarawak in accordance with the Malaysia Agreement 1963, he said. He also reiterated that the National Language Act 1963/1967 (Act 32) which states that Bahasa Malaysia is the official language has not come into force in East Malaysia because an enactment/ordinance has to be passed in the State Legislature. “Sabah has never terminated the usage of English language as our official language as stated in the Cobbold Commission Report IGC (Inter-Governmental Committee) Report and Article 161(3) of the Federal Constitution. “First, we need to understand that the IGC report was part of MA63 because it was an agreement signed by the Federation of Malaya and Sabah and Sarawak. It should be read together with the MA63, and this requirement is clearly spelt out in Article VIII of the agreement. “It is clearly stipulated that under paragraph 17 (1) of the IGC Report, which states that the present policy and system of administration of education in Sabah and Sarawak (including their present Ordinances) should be undisturbed and remain under the control of the Government of the State until that Government otherwise agrees. “Article 161 of the Federal Constitution deals with the use of English and native languages in Sabah and Sarawak. Article 161 (3) however says that no such act of Parliament shall come into operation as regards the use of the English language until the act or the relevant provision of it has been approved by enactments of the Legislatures of the States of Sabah and Sarawak. “And I quote: ‘The IGC Report paragraph 17 (a) states that although Education (item 13 (a) of the Federal List in the Ninth Schedule) will be a federal subject, the present policy and system of administration of education in North Borneo (Sabah) and Sarawak (including their present Ordinances) should be undisturbed and remain under the control of the Government of the State until that Government otherwise agrees – in particular, the present policy in the Borneo States regarding the use of English should continue. “Therefore, in education, it is clear that the usage of English in education should be continued until and unless the Sabah State Government agrees otherwise,” he explained. Tangau also pointed out that it was also agreed and proposed in the Cobbold Commission Report that Bahasa Malaysia is the National Language and that both Bahasa Malaysia and English are the official languages without any time limit for the Borneo States. “Sabah has never agreed to change our present policy regarding the use of English language, not until today; and I hope that we never will. “Therefore, no one should question the rights of Sabah and our people to use English Language as our official language besides Bahasa Malaysia. This is not only an entitlement, this is our right. I would suggest the Federal Government to look into MA63 for the Borneo States, realize the spirit of MA63, respect and honor what is stated in the document. In fact, Sabah rights on English Language, is also enshrined in the Federal Constitution. “Under Article 152(1)(a), “no person shall be prohibited or prevented from using (otherwise than for official purposes), or from teaching or learning, any other language”. There was a case previously which clarified that there is a constitutional right to teach and learn any language as a separate subject. Therefore, any educational institution in Sabah can teach any language, including English language. “Besides the right to teach and learn English, English language can also be the main medium of instruction in any educational institution in Sabah but subject to the national language (Malay language) being taught as a compulsory subject as provided in Section 17 of the Education Act 1996. “For far too long, we have been exploiting the matter of education as part of politics. I believe that in Malaysia Baru, we can be bold enough to speak the truth and do the right thing. Education must be dealt with from a technical perspective instead of making political consideration when it comes to decision making. The importance of taking a holistic approach to educate our future generation in ensuring competitiveness, quality education, employability and opportunities should be the pivot of our discussion. “I believe that the mastery of English is so important, that it is one-way to make our human capital more productive, knowledgeable and competitive. When we master English, we will be able to accelerate in the pursuit of reducing the development gap between Sabah and other states in the Peninsular Malaysia. Sabah is so blessed with land and natural resources. But why are our people still among the poorest?” he questioned. Tangau then said that he does not like to be self-pitiful, so he is not going to talk about why Sabahans are poor and cannot be on par with other fellow Malaysians in the city. “I am also tired of listening to some people telling us that raising the standard of English can be done from time to time. Really? What time do we wait until and what time is suitable? “I want Sabahans to be on the same bus as the world is on. I want us to know what is good for us, what will help elevate us so that we will, one day, be knowledgeable, competitive and competent enough to play the national, and even the global game. “If we Sabahans want to be able to play on a level playing field, then we have to protect our freedom to thrive, in order to ensure that our opportunities are not controlled and our dreams not shattered,” he stressed. Tangau said this when met after the launching ceremony of Kinabatangan UPKO 15th Triennial General Meeting held here yesterday. Also present was the UPKO Kinabatangan division chief, Datuk Masiung Banah. 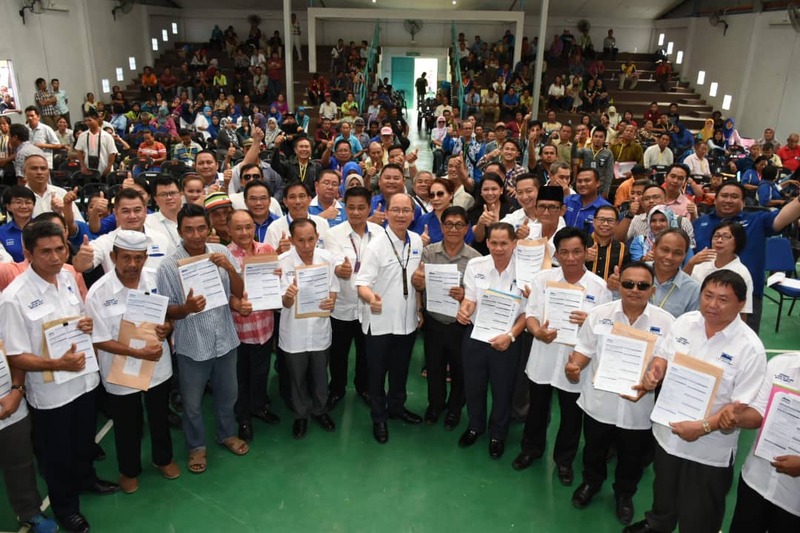 An election and appointment of new UPKO Kinabatangan committee members were also conducted smoothly on the same day and Masiung maintained his position as the division chief of UPKO Kinabatangan. Meanwhile, a total of 832 former members and branch chiefs of UMNO Kinabatangan and UMNO Tongod have quit UMNO to join UPKO. The meeting ended with the new members getting their membership forms from Tangau.